The global settings in TwistedBrush Pro Studio are selected in the Preferences Dialog. Select the Preferences item from the Edit menu. Auto Save Sec is the frequency in seconds that your current image will be saved. Max Undo Steps is the maximum number of undo steps that will be saved. Older undo actions are removed when this limit is reached. Max Undo Mem is the maximum number of megabytes that will be used for storing undo steps. A value of 0 means that TwistedBrush Pro Studio will dynamically determine the best memory usage. The Precision Cursor setting, when enabled, will display a cross hair inside of the standard circle cursor. Also if enabled there is an option to hide the circle cursor and just use the cross hairs. The Square Cursor setting, when enabled, will display a square cursor instead of a circle cursor. When the Brush Numbers setting is enabled, numbers will be added to each brush displayed in the Brush Select dialog for every ArtSet. When the Filter Preview setting is enabled, preview will be off by default in the Filter dialog. The Auto Save Shortcut setting, when enabled, will result in any changed to your currently selected brush always being saved to the brush shortcuts. When the Show Shortcut Brush Options is enabled, icons will be shown for each brush in the Shortcuts panel. The Enable Tablet setting will enable any WinTab compatibility tablet installed on your computer. Use the Tablet Compatibility setting if you have any issue with your cursor not aligned with your strokes being drawn. 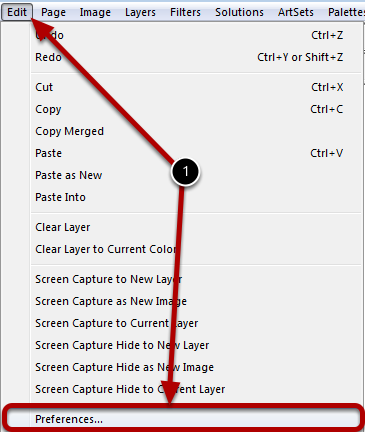 The Start in Page Explorer setting, if enabled, will result in TwistedBrush Pro Studio not loading the last page viewed by default but instead starting the Page Explorer where you can select the page to start with. The Center Page setting will keep the canvas centered in the drawing area rather than in the upper left. The Dialog Visible Adjustment setting will check that all panels that load at start up are not off screen and move them to a visible location. If you have a multi-monitor configuration and you find the dialogs that are visible are being moved to different locations on start up you can disable this setting. The Full Intensity Hue Slider setting determines if the Hue slider in the Color Adjustment panel will show the hues at full intensity or show them to be the color that would be selected if the slider thumb position is moved. The Tool Shortcut is Always Dynamic setting will result in any tool shortcut always being treated as a dynamic selection. Meaning once the shortcut key is released the previous tool will be selected. The Display Mask Opaque setting, if enabled, will show masks with the full range of transparent to fully opaque for fully masked areas. When not set a mask that is at full strength only shows at 50% opacity. The Mask Display Colors setting allows for selecting the two colors used for the mask pattern. Click the color squares to change the color. The Disable Aero on Start setting allows controlling if TwistedBrush will disable the Windows Aero theme. This option exists because some video card drivers are not completely compatible with display features implemented in TwistedBrush. The Stats Mode and Tutorial Mode settings are used for testing, training and brush developers. In most case you will leave these disabled.